If you are reading this, I’m pretty sure you must have made up your mind to start an online clothing store, and why not? With revenue generated up to $80 billion USD in 2018, chances are that it may cross $100 billion USD in another two years. Online clothing industry, being the most popular e-commerce niche, has grown exponentially with time. Well, you can definitely congratulate yourself on choosing an amazing business. But you must know starting an online clothing business is more than just buying a domain name and advertising it. Just because fashion and clothing is popular niche, doesn’t mean you will get instant sales. Popularity often attracts competition. And to beat the competition you need to have a reliable e-commerce solution that supports your business aspirations. So, before starting your own online store, make sure you choose a platform that supports your business and helps it grow. Especially if you are a budding entrepreneur, there are certain obvious features you must check while selecting your e-commerce platform. So focus on your interest, take one step at a time and follow these 7 tips to start your own unique online clothing store. While possessing your own store, you definitely need some authority to change the workflow according to your own convenience. Choose a platform that gives you this freedom. Prefer a partner that doesn’t make you dependent on technical assistance for every small change you want for your store. Also in order to expand globally and win the international audience, multi-domain and multi-language features are quite necessary. Get a platform that offers custom features to create and manage multiple stores in as many languages as you want. Did you know you can also have multiple domains for those languages? 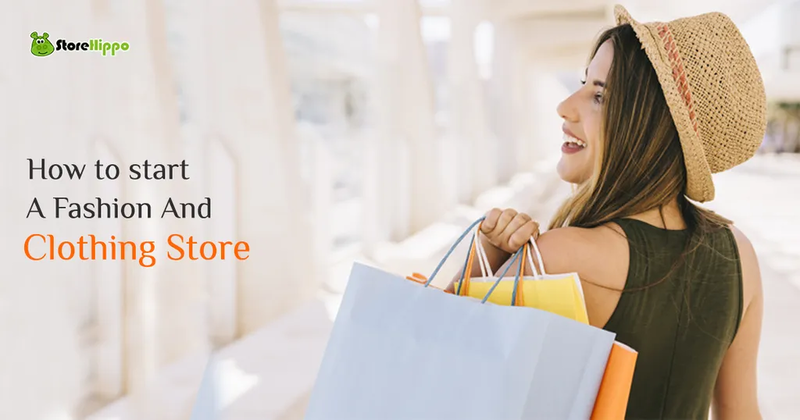 StoreHippo provides features like multi-store, multilingual and multi-domain setup that not only help you manage multiple stores and products but also gets you prepared for an unexpected global exposure. Once you start an online fashion business, where do you see yourself in next 5 years? Obviously growing and expanding. But you don’t want to keep investing in new platforms every time you change the structure of your business. In order to expand or curtail your future business structure, you must always go for a platform that can be scaled based on your requirements. Trust me scalability is a very important feature you want your e-commerce clothing store to have. Through scalability, you can add and remove multiple products and product stores. So apart from providing basic support, your e-commerce solution should adapt to your flexible store format. StoreHippo is inherently scalable and supports scalability to a huge number of products or users. its unique management tools make it a cakewalk to manage your business and as your business grows you do not have to think about migration to other platforms. Technology is worthless until it is simplified for common people. A similar situation goes for any e-commerce solution. There are already many complexities in handling the fashion business. The last thing you want is a complex dashboard to manage your store. Choose a solution provider that takes care of your needs in a simplified way. I may sound a little too particular, but trust me when it comes to managing your store backend, you need reliable support. Go for a dashboard that lets you make shortcuts and help you analyze your analytics with ease. The navigation should be systematic and customizable. It must also link you to the social media and provide proper notifications. With StoreHippo e-commerce solutions you can have consistent support and get the best possible customizable dashboard for your store. Logistics and Cash on Delivery services have the power to make or break a customer relationship to quite an extent. A smooth and streamlined logistics service is the backbone of any successful online clothing store. While picking an e-commerce solution, you must ensure that your platform offers easy integration with the shipping partners. It must provide tracking notifications on your platform and update the customers as well. You must also make sure if you can avail discounts on shipping in near future. If you are planning to expand your online store globally check for international carriers as well. Go for a growth-oriented partner that provides a simple yet automated shipping management system. StoreHippo provides hassle-free third-party integration for logistics and COD services. You can not only track your fashion products with ease but also keep your customers updated using the inbuilt automated tools. We often feel like making certain changes to our own stores. Get that right shade of pink for the navigation bar. Make the footer more eye-catchy. But most of us being non-technical entrepreneurs, fail to execute even the basic design changes. Get an e-commerce platform that gives you the freedom to change the look and feel of your store. Liberating, isn’t it? Go for a clothing store solution provider that has an easy user interface, where you can easily change the banners per discounts and offers. You can also change the colour and theme of your store as per the seasons or festivities. Just make sure you use high-quality pictures and focus on the deals. StoreHippo has a diverse collection of themes for your store. It gives you the flexibility to experiment with the look and feel of your fashion hub and helps you to make it look more trendy, easy-to-navigate, and reliable. If you dream to give global exposure to your online store, make sure you get an e-commerce solution that provides multi-currency payment service. The online businesses that have expanded internationally have this feature intact. The multi-currency feature not only saves the customer’s time to calculate the actual price in their currency, but it also gives a sense of trustworthiness to the customers. Initially, it may not seem important, but what if your clothing store doesn’t integrate with an international payment gateway after a few years when you plan to expand. You will have to look for a new e-commerce solution. In order to avoid that extra effort and money, pick the platform that supports multi-currency and its conversion at your end as well, so that you can manage your revenues without any hassle. StoreHippo has such an inbuilt multicurrency feature that will surely help you make your mark in the international fashion market. Opening an online store is easy, Getty regular sales and acquiring new customers is not easy. Your store is online, so you need to make your online existence more prominent. Building a brand has never been easy. You will have to use social media and even other marketplaces to promote your clothing products. Choose a platform that provides easy integration of marketplaces and social media sites. It must give all the notifications on one platform and help in analyzing the customer analytics for your clothing store. StoreHippo offers services that not only makes marketing manageable on different platforms but will also fetch more leads. Creating an online store with an edge might seem like a daunting task, but with StoreHippo as your technology partner, your online journey is simplified. You don’t need months of coding and designing to set up an online store. With StoreHippo’s easy to use features it just takes a few hours to make a trendy fashion store for your clothing business. You came here to discover how to make a unique online store. Well, we are here to help you do that. StoreHippo is a platform that provides end to end e-commerce solution. You can easily start and manage your store with tried and tested features of our e-commerce solutions. Our technology makes everything simple. You can have a trendy, professional online clothing store that has stickiness and keeps attracting customers. For more information or any kind of assistance, feel free to call on +91-80101 17117 or reach us at reachus@storehippo.com.